Hi Jean. Just wanted to let you know that Dad and I went out to Penney’s. They are going to make an 8×10 in Black and White of Gracie. They gave us the two 5x7s of Gracie that were Black and White that they made the mistake on. We can pick ’em up about the 12th of September so everything is all set there. So. Love you much. Tell Gracie and Riley “Hi” and give ’em a kiss from us. Tell Benny “Hi” from us too. So, we’ll catch you later. Bye Bye. Hi. James. Just wanna like you know that. Then i went out the counties. They are going to make. A lot. 8 by 10. In black and white. Of grace c. They gave us the 25 by 7 so crazy that were black white that they made the mistake. Oh. We can pick them up. How about the calls. Of september self everything’s all set there. Help. Love you might. Come grey see in riley high and give them a cure for us to come down in. High for us to. Help okay too late by bye. 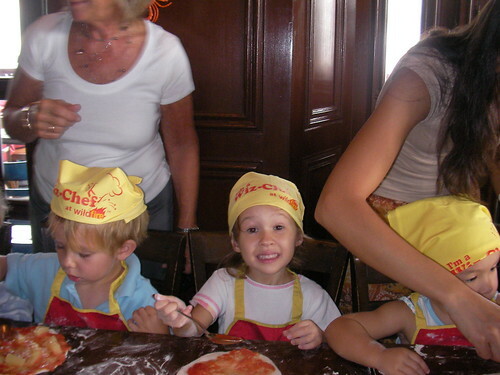 For those of you who wanted to see more of our little pizza chef, here ya go. Check out Grace’s excellent dough kneading and pizza sauce-spreading skills. Last weekend, me and some fellas went to Tokyo for the weekend. We went there for the Summer Sonic music festival. Pretty good show. I saw Cindi Lauper, Motorhead and Bloc Party all on the same day. Other than the show, we hit the town and had a great time. Download the video to iTunes. So I finally started doing videos on my Mac. Here’s one of my first. A fun time with the girls at the beach. Grace had a school field trip yesterday to a local restaurant. They made their own pizzas! Last night we had our department summer cruise. We hired a boat and took it out to Clearwater Bay, played some games, sang some karaoke and did a lucky draw for some prizes. We had a great time. Check out the video. Click here to download the MPEG-4 version.